This seems like it’s been a long time coming and, in a way, it has. The Bellman Hangar was built in 1940 right on top of the original section of the finishing straight at the famous Brooklands’ race track. Of course, being World War Two no one cared about a 30-year-old race track when there were far more prescient matters at hand. Subsequently the old hanger itself became Grade 2 listed. With great insight the “problem” of the hanger became a “bonus”. 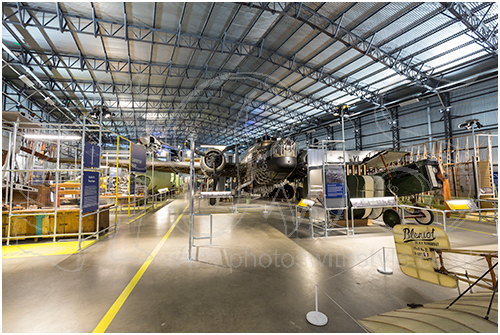 At a cost of £8 million (including a £4.7 million grant from the Heritage Lottery Fund) the hanger was dismantled, sent to South Wales to be restored. It was then placed just to one side of the race track and reinterpreted as a factory. Speakers throughout the hanger/factory give it an authentic “factory floor” feeling. It is very children friendly, but there is plenty of opportunity for everyone to learn the old skills of what was required to build an aircraft and in doing so gain an understanding into how they work. If you like this picture you may also like my Other Vehicles gallery, within the Live gallery.